Columbus Museum of Art, in partnership with the Barnes Foundation, presents an exhibition featuring one of the greatest artists of all time – Pablo Picasso. Inspired by CMA’s Picasso Still Life with Compote and Glass, 1914–15, the show features some 50 works drawn from major museums and private collections from around the world. The exhibition explores how Pablo Picasso’s work was impacted by the tumultuous years of the First World War, when the artist began experimenting with both cubist and classical modes in his art. Important canvases by Picasso’s contemporaries—including Henri Matisse, Amedeo Modigliani, and Diego Rivera—will also be presented. 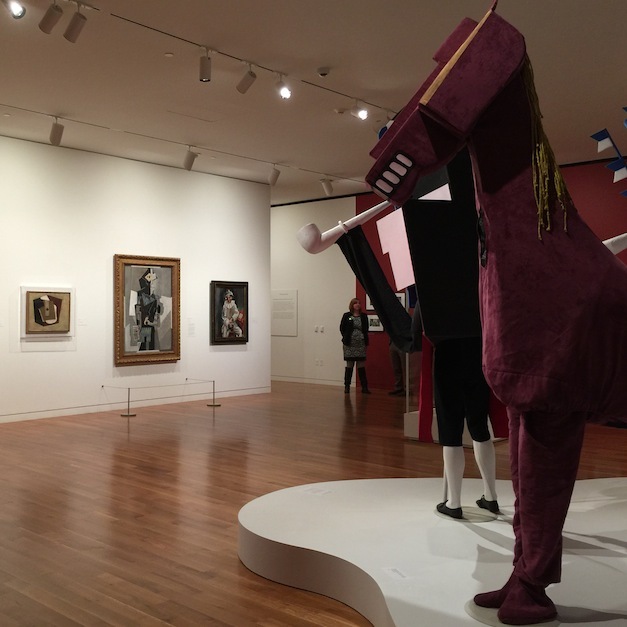 The exhibition also features four costumes that Picasso designed for the avant-garde ballet, Parade, which premiered in Paris in 1917. Parade was the first cross-disciplinary collaboration of its kind. The ballet, which tells the story of an itinerant theater group performing a sideshow, or a parade, was viewed as a revolutionary approach to theater. Picasso was the first avant-garde artist involved in such a production. With Picasso’s strange, geometric costumes, Parade might be seen as the ultimate fusion of classical and cubist forms. Managing Curator for Picasso: The Great War, Experimentation and Change at the Columbus Museum of Art is Chief Curator, David Stark. Martha Lucy was the managing curator at the Barnes Foundation. As a complement to Picasso: The Great War, Experimentation and Change, CMA is delighted to present Pablo Picasso: 25 Years of Edition Ceramics. Internationally famed for his paintings, sculpture, and graphics, Pablo Picasso was long intrigued by ceramics. After seeing the works of the Madoura potters at a crafts fair in 1946, he asked Georges and Suzanne Ramie, who operated the studio, to provide him with the opportunity to work with them. Member guests: $6 Picasso admission. Member guests receive free general museum admission, and only need to pay the special exhibition fee. Guest privileges are determined by the level of membership. $9 Seniors & College Students; $6 K-12 Students. Please note: Extended hours for Picasso, Friday September 9, and Sunday September 11 until 9:00 PM.